Confession: I placed a huge Uniqlo order at the beginning of the month. It was so large that they had to ship it in two huge boxes. I was extremely unmotivated to open them until this weekend. Lots on sale at Uniqlo lately. Here are my sale picks which all happen to be $19.90 and are polka dot or stripe strong. Three of the four pieces below are from the Ines de la Fressange collection that I previously wrote about. Really really love this collection! The striped top is cut to accommodate non-ruler figures. I love it. I highly recommend it and the dress version. Note: this is a thicker cotton so will not be suitable for a typical hot summer day. Lightweight parka comes in various colors. 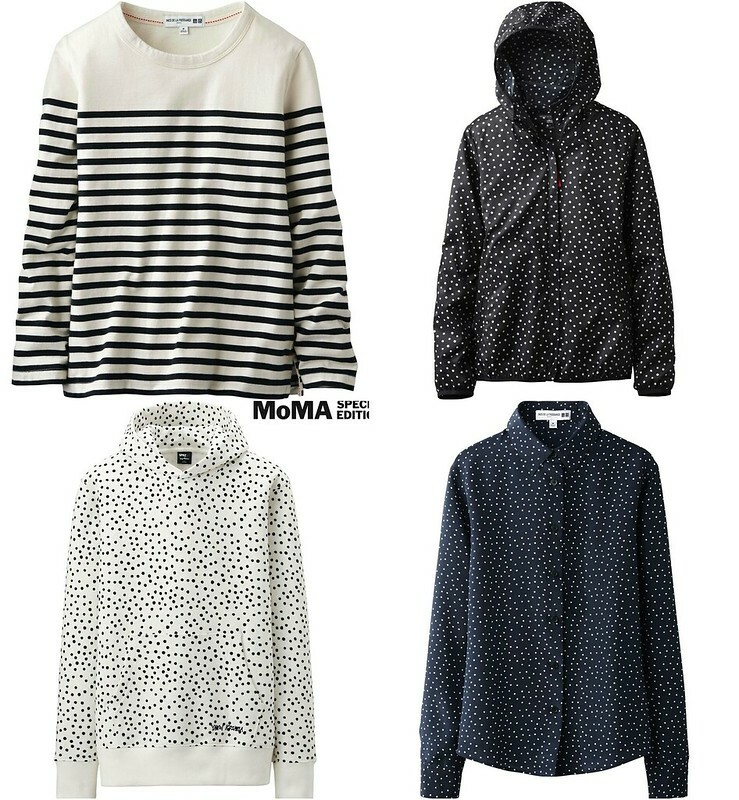 This hoodie is from a collection with Yayoi Kusama and was from the guys’ side. If you really like it, Moma has it in stock. Usually silk blouses are too high maintenance for me. This IDLF one is cut well and can be machine washed! As for the non-pictured John Robshaw collection. I am not a fan of the tees, but the linen dresses are cut well. 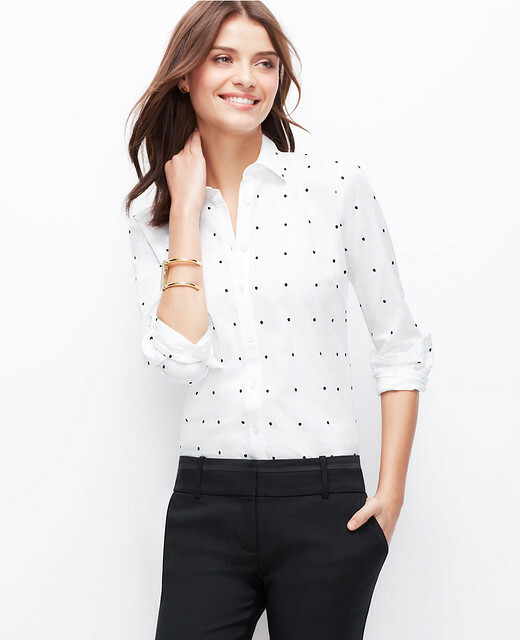 The sale on Ann Taylor sale is now 60% off. Which is a little bit annoying because I just placed an order yesterday! Ann Taylor does restock, but they’ve been on my black list lately for delayed cancellations. The 60% off sale ends at midnight PT tonight. If you miss it, don’t be too sad. This embroidered dot perfect shirt is really cute and well made. The dots are embroidered! Sorry, only petites are available now but if you’re of the unbutton/roll up the sleeve variety, it may not matter. This spring leopard jacket has been hanging on the back of a door. I like it — lightweight, dressy, distinct — but do I LOVE it? That’s to be determined. 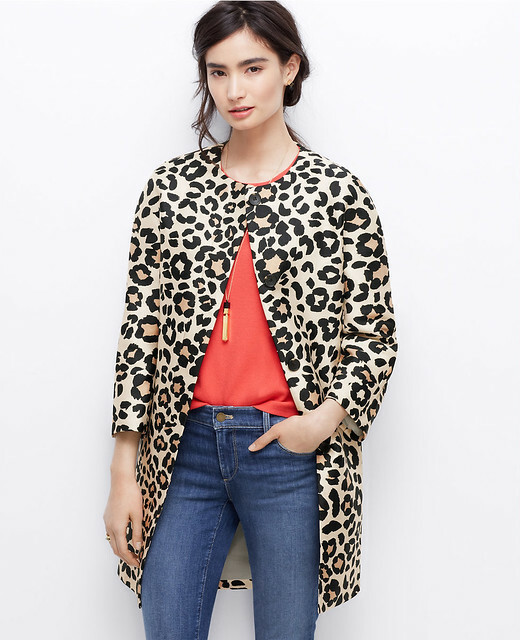 Extremely tempting at $60, as is this pretty sold out relaxed trench. I used to check Forever 21 new arrivals at least once a week. The “good” stuff goes fast, I’d say! Now that I’ve gotten older, my tastes have matured a bit and I haven’t shopped at Forever 21 in years. Uniqlo is the object of my obsession — quality and durable style. Despite having relatively easy access to multiple Uniqlo stores, I’m lazy and still prefer to shop online. Their October anniversary sales are continuing and collabs are up this week. As I mentioned in earlier posts, I’ve been very impressed by the Ines de la Fressange collection especially after seeing her last collection. If you’re looking for any of these items, you must check it out! The sale is through Sunday. More of the collection will be dropping next month. Note: while these items are in black or blue (aka my favorite colors! ), most of these items come in colors other than black and blue. I’m also including a review of Urban Sweats at the end of the post. If you’re a member of the free American Express membership rewards program, you can redeem points instantly for Gap/Old Navy/Banana Republic gift cards through their iPhone app for use in-store or online. I don’t see any discounts right now, but Gap regularly has 15-30% off codes on their website. Most codes are broadcast that way. If you have a giftcard for Gap/ON/BR, it works on any of the 3 brands as well as Piperlime or Athleta. 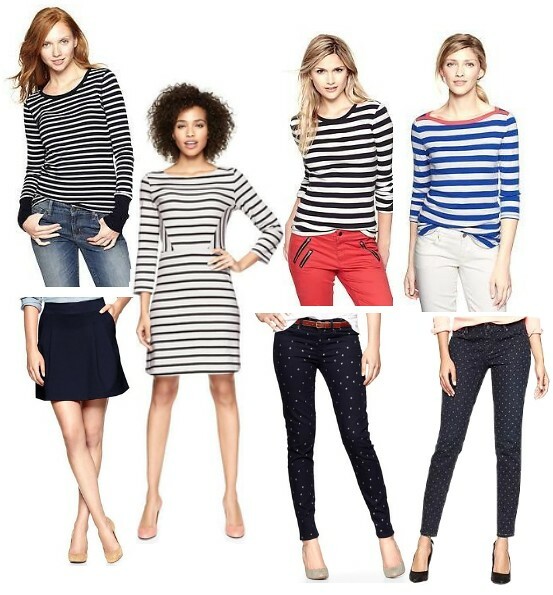 Gap is a total stripe or dot lover’s paradise right now. I think it’s a bit too much; not every item creates the same level of excitement. Striped waffle crew. This top is super comfy. I got it in navy/white and couldn’t stop wearing it on the weekends. It runs big. Striped boatneck dress. This dress got restocked in all sizes and lengths while I was writing this post! Items with no reviews always intrigue me. It looks cute and the black stripe color reminds me of J.Crew’s side seam top (which was poorly executed). Bowery supersoft striped crew. This is super soft (hence the name) and runs big. It lacks structure, due to its softness. Supersoft striped boatneck T. Boatnecks are my favorite neckline. As seen on Jennifer Hudson in the latest Lucky Mag. Ponte flare skirt. I’ve been wearing a ton of ponte this season (others being the Gap ponte pencil skirt and the Baukjen Maryna blazer). This runs TTS and short, so I got the tall length for work purposes. 1969 metallic dot legging skimmer jeans. These jeans are super cute. They run TTS, but also super short since they are skimmers. They are selling out quickly. 1969 dot always skinny skimmer jeans. These are a much more subdued polka dot jean and a new arrival.